I have not been using my blog, and it is time to begin. I find so much useful information on the internet, especially on blogs, that I almost feel guilty that I’m not giving back in some way. I want to begin by listing my sermon series ideas and graphics. Maybe I can help some fellow ministers as they research and search for ideas. I know that if I relied solely on my own ideas, I’d be in a lot of trouble. Tonight, we will be starting a new sermon series on the Ordo Salutis. I will be preaching this to a student group of high & middle school students, primarily on the younger end. Several of them just recently moved up from our children’s ministry, so I’m really at a place where I am trying to lay a lot of ground work and get them thinking about their faith and what it means to be a Christian. In this post, I wanted to give a quick overview of our topics, along with my source material and series graphic. This series is built on a couple different sources. First is Chapters 4-7 of Donald N. Bowdle’s Redemption: Accomplished & Applied. Dr. Bowdle was one of my favorite professors in college. In fact, I believe that I took every class that he was teaching during my time there (Systematic Theology I & II, History of Christianity I & II, two semesters of Koine Greek & Johannine Literature)! This is a short book that gives a very good, concise overview of God’s plan of salvation. I had to tweak some of the language to get the material in a form that teenagers can easily digest, but adults should have no problem at all with it. 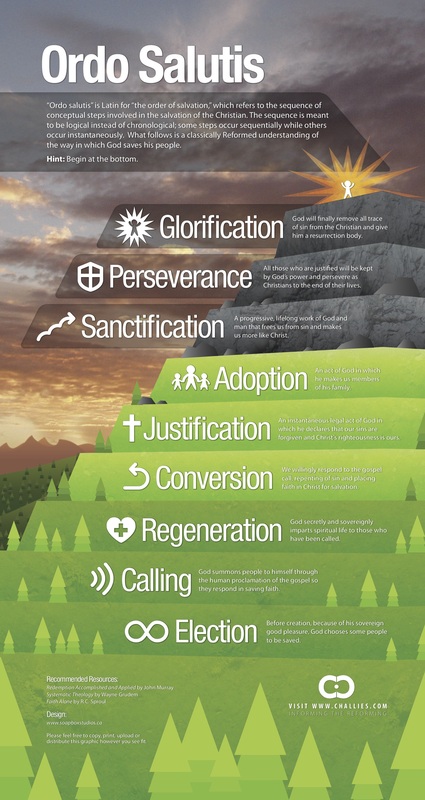 The other source I used is this graphic from Tim Challies’ Visual Theology series of infographics. He’s obviously from a Reformed background, so I had to adjust a few things to fit with our doctrinal beliefs, but on the whole, it’s a great resource and I’m very grateful that he provides it free-of-charge. Over the next few weeks I’ll be trying to manuscript these sermons, which is a departure from the norm for me. I’m more of an outline kind of guy. I hadn’t manuscripted a sermon in a while, and I like that it is really making me labor over the wording to communicate precisely what I want to say. The first sermon and graphic should be uploaded tomorrow.